Being able to write a complete sentence is the foundation upon which all writing skills are built. It sounds simple enough, right? As we teachers know, however, some students struggle with forming a complete sentence, even in the upper elementary grades. If they make it too short and omit the all-important subject, they're left with a fragment. If they string too many ideas together and make it too long, they're left with a run-on sentence. To quote Goldilocks, it needs to be "just right". 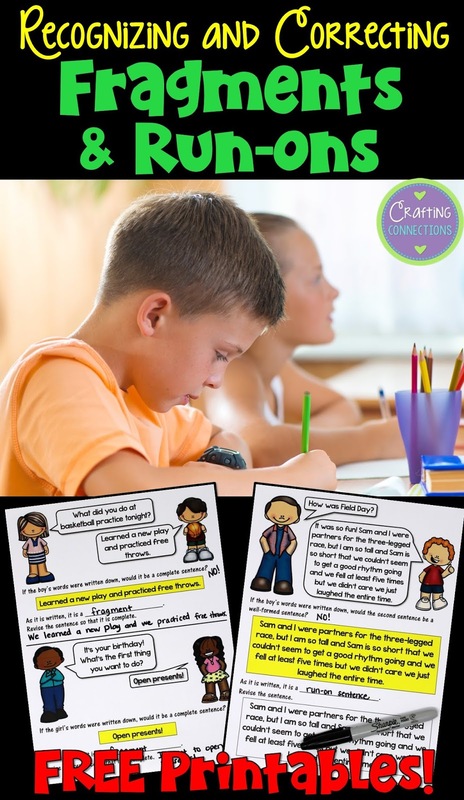 Today I'm going to share a couple tips with you that you can use as you teach your students how to recognize and revise fragments and run-on sentences. Tip #1: Emphasize that fragments and run-ons are usually overlooked when speaking, but not when writing. First, I believe it's critical to point out to students that when we speak, we often use fragments and run-ons. In contrast, fragments and run-ons are taboo when it comes to writing. Many students notice this difference in expectations on their own, but some students benefit greatly from having this difference explicitly brought to their attention. Consider these conversations that highlight how we frequently use fragments and run-ons when we engage in casual conversation. Mom: What did you do at basketball practice tonight? Child: Learned a new play and practiced free throws. Dad: It's your birthday! What's the first thing you want to do? Mom: How was Field Day? Child: It was so fun! Sam and I were partners for the three-legged race, but I am so tall and Sam is so short that we couldn't seem to get a good rhythm going and we fell at least five times but we didn't care we just laughed the entire time. The answers given by each child are acceptable when the child speaks. However, those same answers would be considered poorly-formed sentences if they were written as they were spoken. I created a free handout you can use as you explain this difference to students. You can place the poster below the document camera, project it onto a screen, and work through the sentences together. Click on the photo to download it. Tip #2: Procure student writing samples. 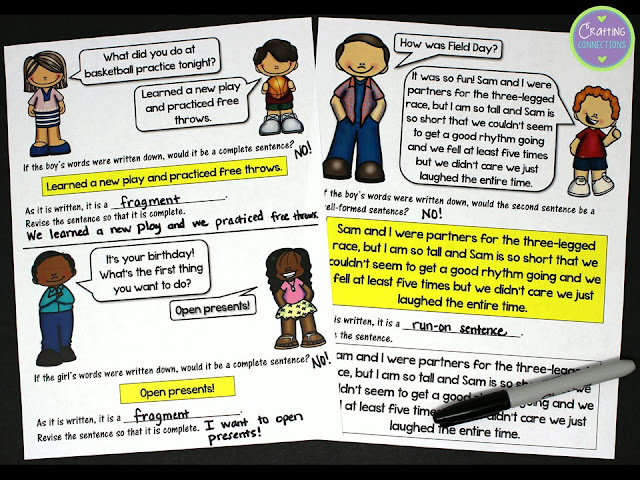 Do you save samples of students' writing throughout the year to use as models for next year's students? If you are like me, your answer is "no". However, I encourage you to start saving those student writing samples. In the book, Embedded Formative Assessment, Dylan Wiliam lists many reasons why it's helpful to save writing samples that are both strong and weak, and then use them as teaching tools with future students. If you are interested in learning more, you should definitely read Wiliam's entire book, but I want to share one quote from Chapter 3. He writes "Some teachers wonder why a class should spend time looking at other students' work when they could be doing their own work, but as many teachers have discovered, students are much better at spotting errors and weaknesses in the work of others than they are in their own. Once students have pointed out such errors or weaknesses, they are more likely to avoid repeating them in their own work." I must admit, I have thought about saving student samples many times, but I've never actually done it. Just imagine, though... when you're teaching about sentence fragments and run-on sentences, wouldn't it be so handy to be able to pull out of your filing cabinet a few rough drafts written by previous students, project one on the screen, and have your students help you revise the sentence fragments? I think I know what you're thinking... that's all well and good for next year, but what about this year? 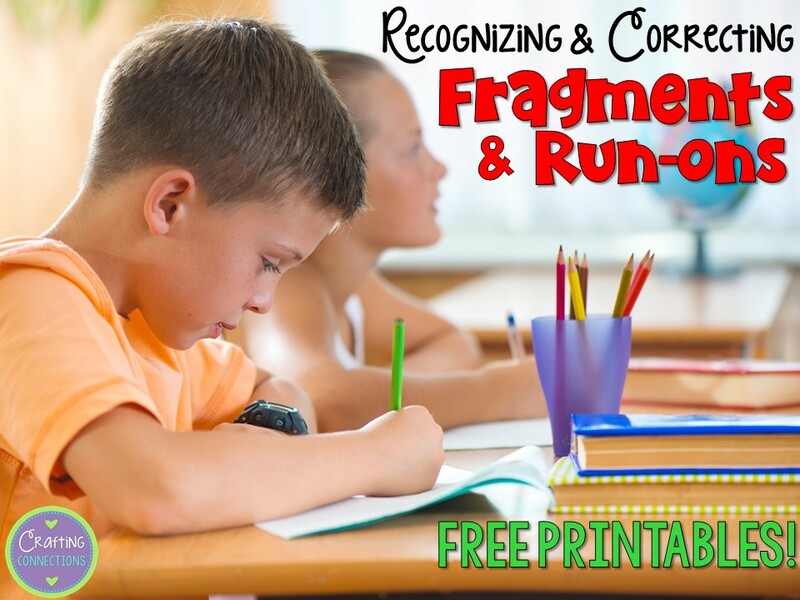 One solution is to ask another teacher (perhaps from a different grade level or from a different school just to ensure the writer remains anonymous) if he or she would photocopy a few of his/her student's rough drafts that contain fragments and/or run-ons. Then, you can lead your students in revising that student's paragraph. Another solution is to write a mock student writing sample yourself. 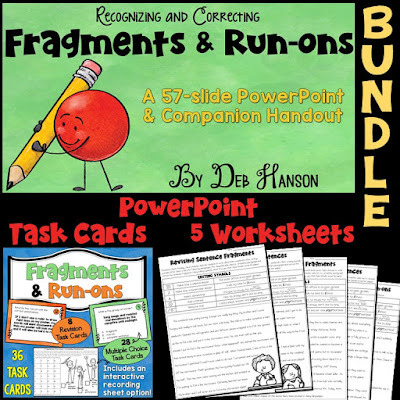 A final solution is to use one of the worksheets in my Fragments and Run-ons Bundle. Click on the image below to check it out!